Reuters Eikon has added Bitcoin to its suite of tracked assets, announcing that “traded rates and volumes as well as top of book quotes are all now available for you to act before the market moves.” The service will be tracking USD trading activity from the Bitstamp bitcoin exchange. One may ask how a trader will be any more ahead of the market than by following Bitstamp directly. Eikon is Reuters’ flagship financial information platform, like the information component of Bloomberg’s Professional service. It’s branded to “discover more profitable opportunities”, as echoed in its Bitcoin announcement. The features will track data like bid, ask and traded prices, plus volumes and intraday and historical charts going as far back as 3 years. The latter statement also deserves some scrutiny. What is meant by “a valid means of exchange”? If referring to the fact that most governments haven’t outlawed Bitcoin, this is trivial. Governments haven’t outlawed lots of things. And if to say that it’s been recognized as legal currency, this is certainly not the case. The tracking of volume from only one exchange may also be a point of debate. While Bitstamp is a leading exchange, its volumes are but a fraction of the total market and are reportedly exceeded by several exchanges in China. While they rank near the top in dollar-based volume, it may be more prudent to omit volumes altogether, as done by Google and Yahoo in their tracking of Bitcoin as currency. Reuters has typically been lower key on major Bitcoin developments than rival Bloomberg. Bloomberg has featured multiple reports and interviews, often involving passionate debate. When Yahoo and Google added Bitcoin to their Finance portals, there was no accompanying announcement. For all we know, the features may have been around for some time, notwithstanding the likelihood of keeners having checked for it every day for the past few years. 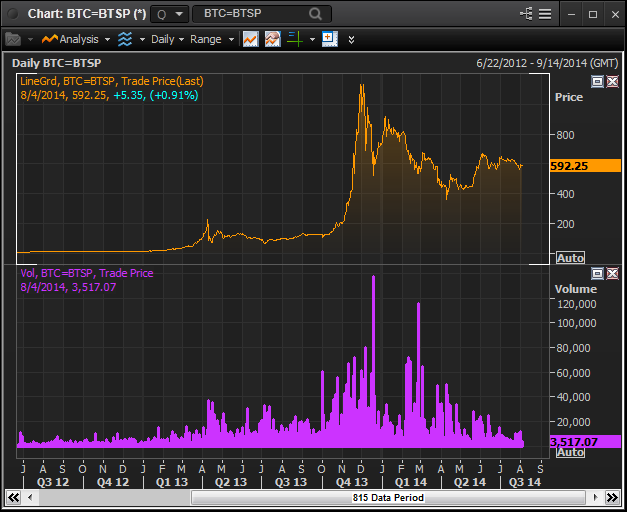 When Bloomberg added Bitcoin, it was abundantly clear that it is not endorsing Bitcoin in any way. They even went as far as to make a disclaimer about its controversial nature. Reuters’ exuberance does therefore appear somewhat out of place.